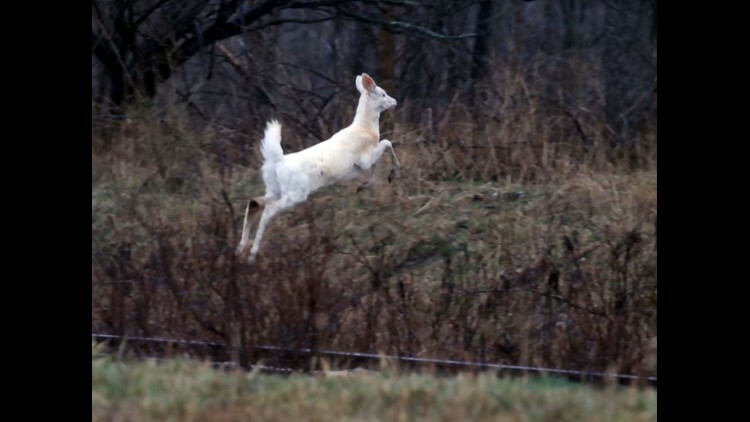 A Seneca white deer leaps over a ditch in part of the former Seneca Army Depot in Romulus, N.Y., that's now Deer Haven Park. 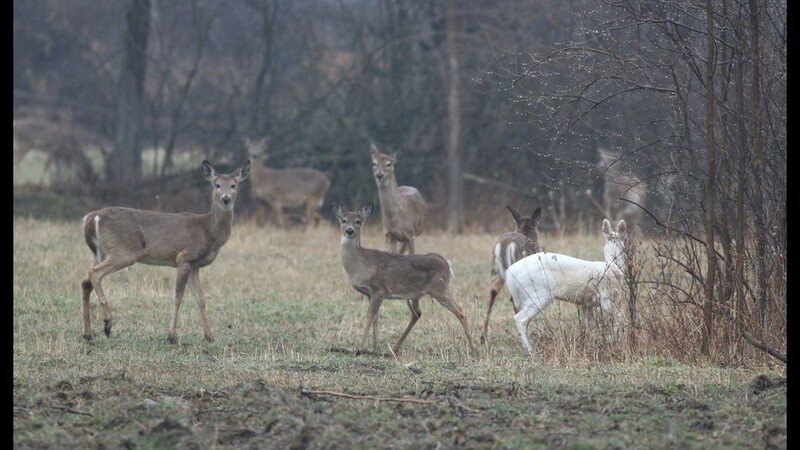 ROMULUS, N.Y. — The world's largest herd of white whitetail deer now have their own sanctuary — and tourists also can find a nest of a mating pair of bald eagles, a dam built by a beaver colony, and a former munitions igloo on the site of the former Seneca Army Depot. 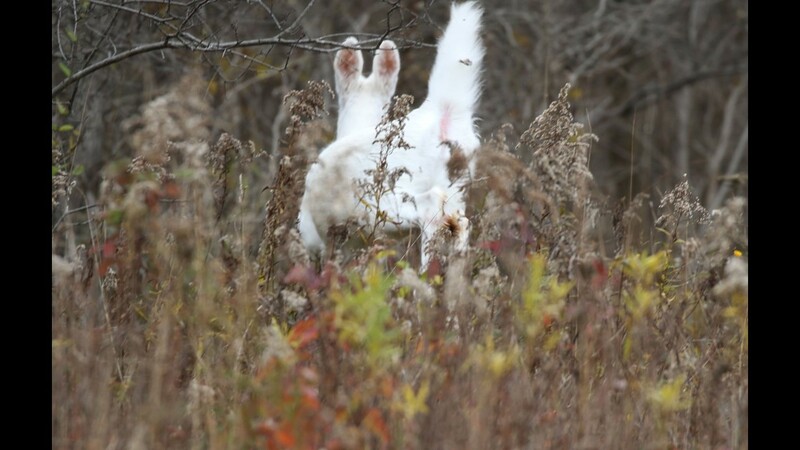 Unlike albinos, the Seneca white deer at Deer Haven Park are a natural variation of brown-colored deer that lack pigmentation in their hair. 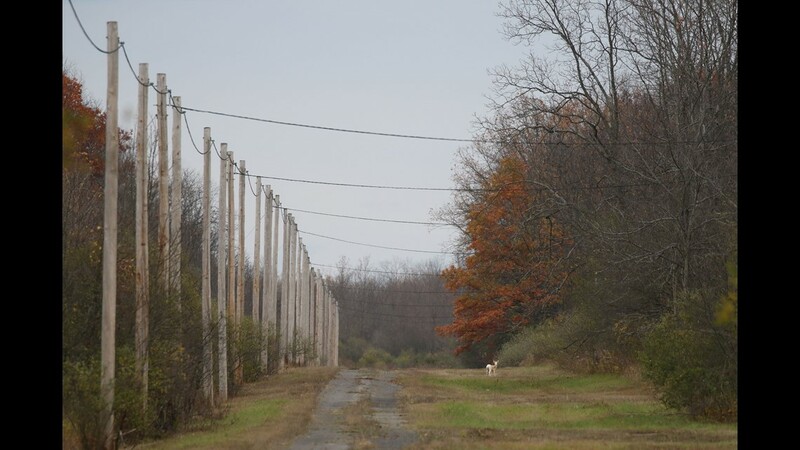 In 1949, the first white deer were spotted at the depot, which was built in 1941 at the start of World War II to house and dispose of munitions. Col. Frank Kemble Jr., the base's commander, prohibited killing the white deer that lived with the more common brown deer, and the white-coated herd at one point grew to more than 200. But as the Army’s presence decreased from 1995 when the Pentagon announced the depot's closure to the year 2000 when the military pulled out, predator kills, poaching, habitat degradation and starvation increased. 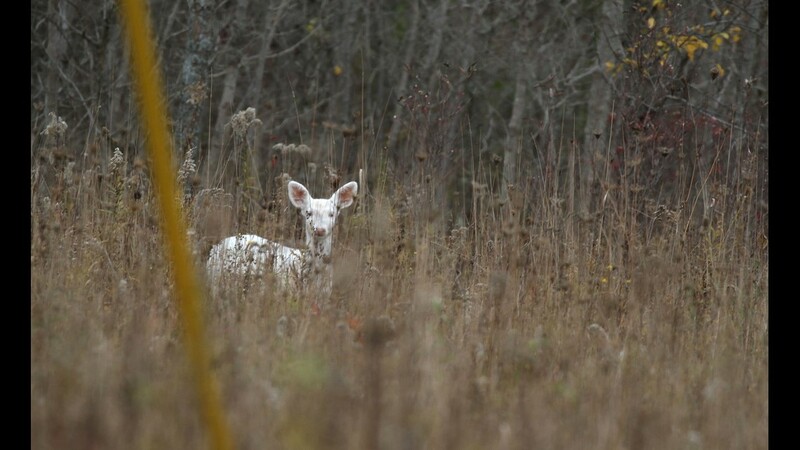 An aerial census two years ago revealed only about 75 white deer, but that's changing. 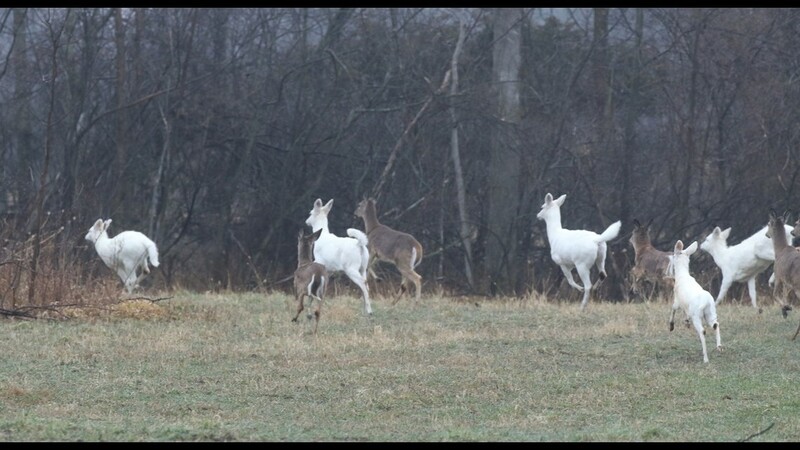 “The white deer are increasing in numbers. 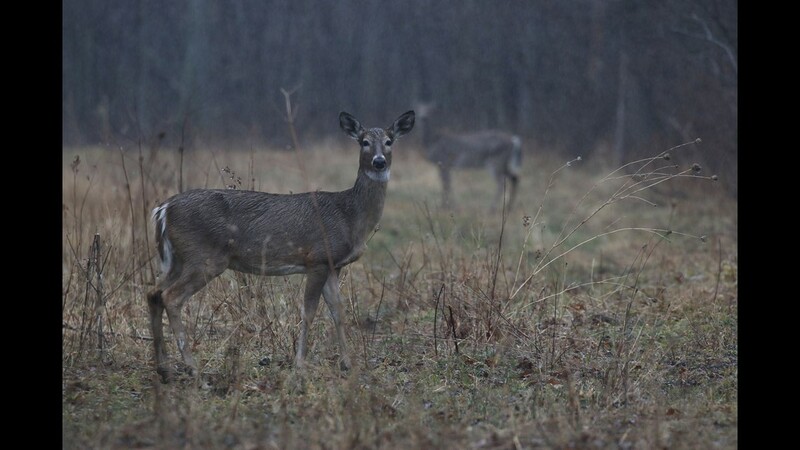 We’re looking forward to a very nice fawn crop,’’ said Earl Martin, whose purchase of 7,000 acres of depot land became final earlier this month. His $900,000 bid for the depot called for a $13 million expansion of his business, Seneca Iron Works; the creation of 200 jobs during the next decade; establishing 20 Amish homesteads; and putting land back on the tax rolls. 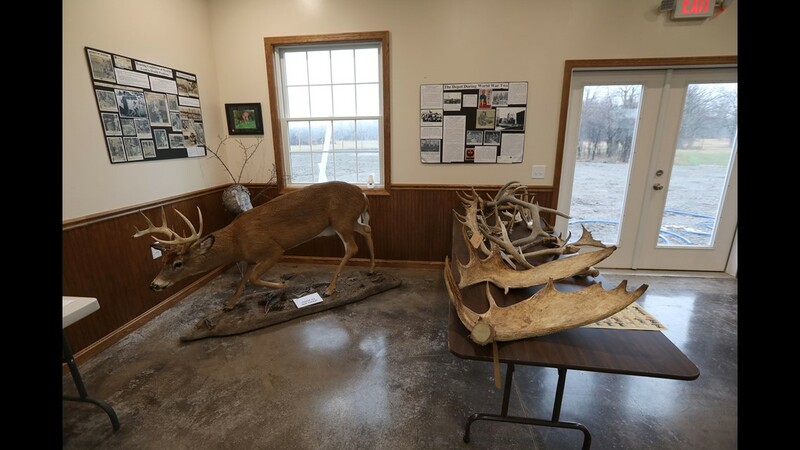 It also called for leasing 2,800 acres to a nonprofit group called Seneca White Deer Inc., which was formed in 1998 to save the white deer while promoting the economic potential of the depot as a tourist attraction. “I’ll be candid,’’ said Martin, 39, of Seneca Falls. “I didn’t purchase the depot with the goal of doing a wildlife park. The original bid was that it would be a place to expand our business knowing we’d do something for the white deer. “But interesting enough, I’ve got a bit of an affinity for the deer now," he said. "They kind of grow on you. Now I’m down at the depot every other night and on weekends and just having an awesome time." 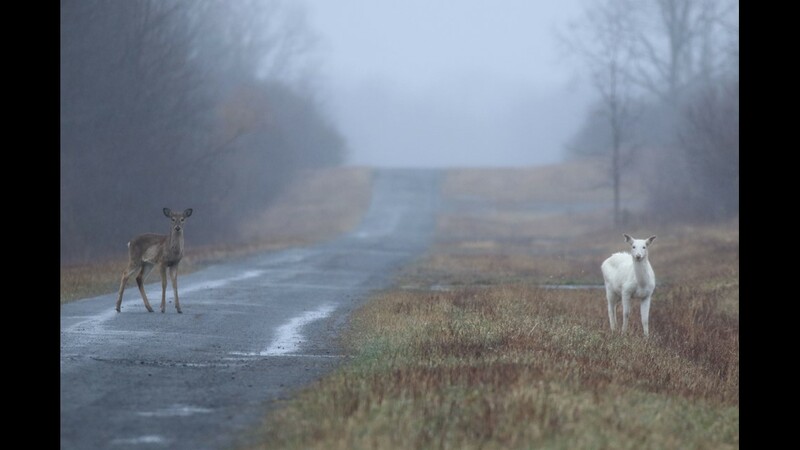 He first saw the deer at age 9 when his family took a ride past Seneca Army Depot to show his grandfather, visiting from Pennsylvania, the mystical white animals that lived inside the 24 miles of fencing around the government installation. His grandfather predicted that someday he would own the depot. Now the land off New York 96A about 3 miles west of Romulus features a spacious $255,000 welcome center, built entirely with donations that came in from around the world. Seneca White Deer owns it, and that's the starting point of the sanctuary's tours that began on a regular schedule in November. More than 2,300 people took a tour of Deer Haven Park in the first five months of operations, according to Seneca White Deer. "This isn’t a petting zoo. 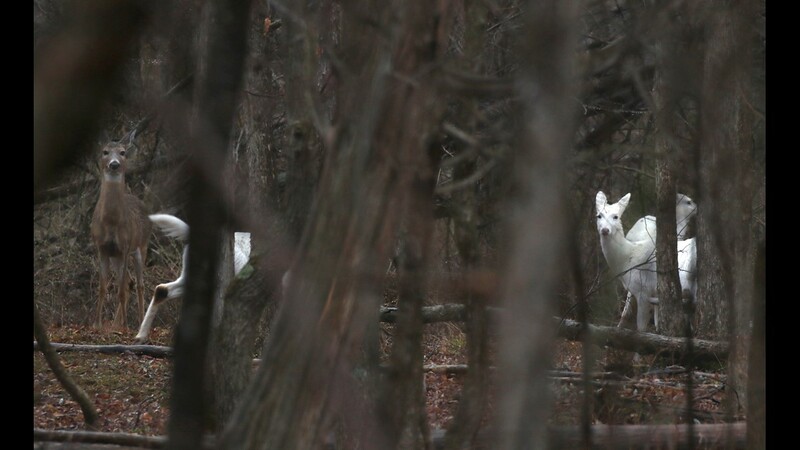 These are wild animals,’’ Dennis Money, the organization's president, said as the first white deer was spotted on a recent tour for media and Finger Lakes winery and bed and breakfast owners. After learning about the wildlife and military history of the depot from various displays and possibly purchasing a mug or T-shirt, visitors board a 25-passenger tour bus that runs every two hours 8 a.m. to 2 p.m. Thursday through Sunday. The tours are a combination of photo safari and a trip through a military museum frozen in time. Visitors can find the entrance to Deer Haven Park near Romulus, N.Y., on New York Route 96A about 3 miles west of the town of Romulus. At one time, 100 million pounds of missiles, bombs, bullets and grenades were stored here. So were strategic ores, including pitch blend that contained the uranium used to make the first atomic bombs dropped on Japan. Pulling up to the entrance gates of the depot’s highly classified “Q’’ area, visitors get a sense of the seriousness of storing nuclear weaponry when the rusted remains of triple, electrified fencing come into view. “The depot was built in about six months with 100 miles of roadways, 40 miles of railroads and 519 ‘igloos’ or ammunition bunkers,’’ Money said. “When you look at these bunkers, you get impressed by how the men and women of that era were building six or seven of these every day. Money, 71, of Canandaigua is a retired environmental specialist with Rochester Gas and Electric Corp. 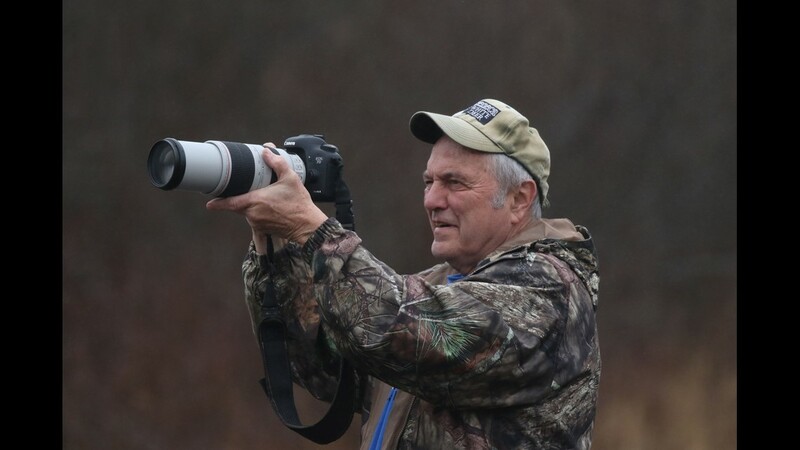 He has been involved with some of western New York’s most notable wildlife restoration projects, including river otters and peregrine falcons. 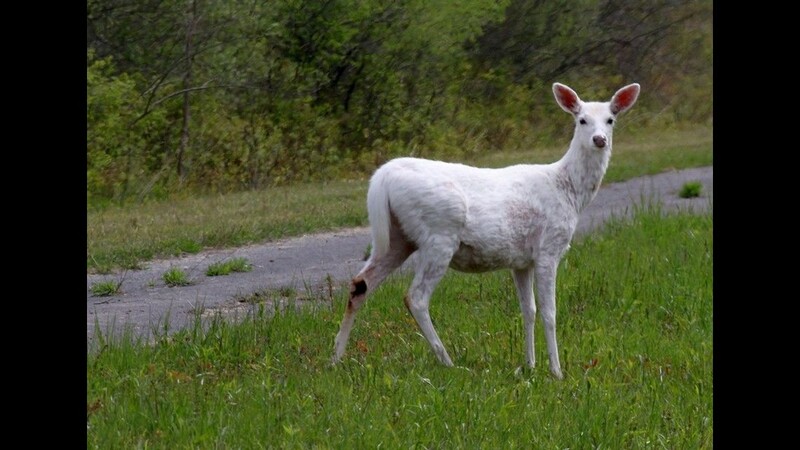 But Seneca Army Depot's white deer didn’t need to be restored. They needed to be saved. If the depot's fencing had been removed as part of its redevelopment, the rare hoofed animals would have become easy targets for hunters and predators. Some white deer do escape the perimeter fencing, but Martin's investment has made that more difficult. Before he purchased the land, he leased it and in June 2016 began an aggressive program of habitat restoration. Working with ecologist Keith Tidball of Cornell Cooperative Extension, Martin’s crews planted 250 acres with soybeans, corn, turnips, radishes and high-protein grasses. They also planted more than 4,000 trees — fruit, conifers, oaks and dogwoods — providing food and cover for deer, wild turkey and songbirds. 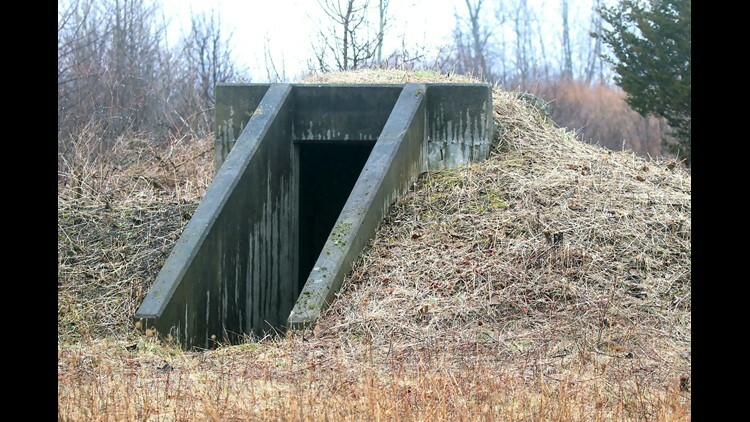 A small bunker at what used to be the Seneca Army Depot near Romulus, N.Y., recently was cleared of weeds for tourists to view. They repaired miles of fencing and increased security to help cut back on vandalism and poaching. Coyotes, the depot’s main natural predator, also are being managed through trapping. 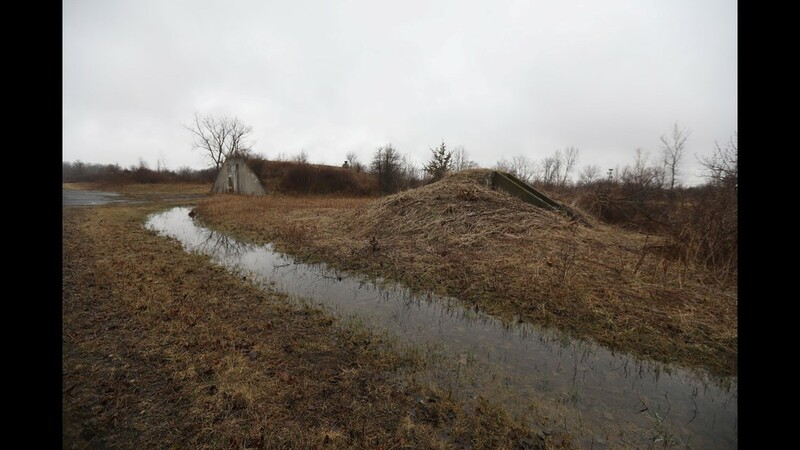 On the tour, visitors can exit the bus to explore the beaver dam, an emergency bomb shelter and the site of a former Seneca Indian village that white settlers took over. A cemetery contains soldiers' remains from the Revolutionary and Civil wars. “As a conservation park, you’ve kind of taken the sword and beaten it into a plow share,’’ said Money, whose army of volunteers have cleared bunkers of overgrowth for viewing. “We think we have something unique that nobody else in the world has here." “I loved it,’’ said Jim Doolittle of Frontenac Point Vineyard in Trumansburg, whose wife, Carol, is a Seneca White Deer volunteer. “Guests are always looking for things to do, and you won’t find anything like this anywhere else." 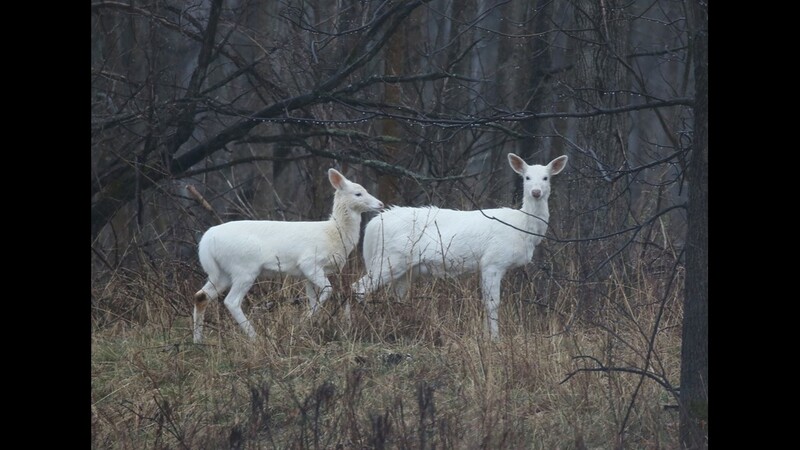 Witnessing a white deer in the wild is a moving experience, said John Ingle, owner of Heron Hill Winery in Hammondsport. 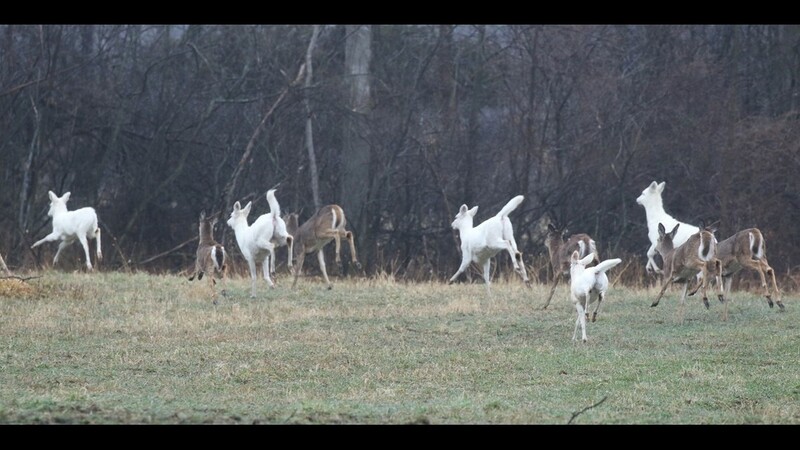 “Whoever sees the white deer doesn’t forget it,’’ Ingle said. “It’s almost a religious experience. They are so majestic and wonderful to witness." 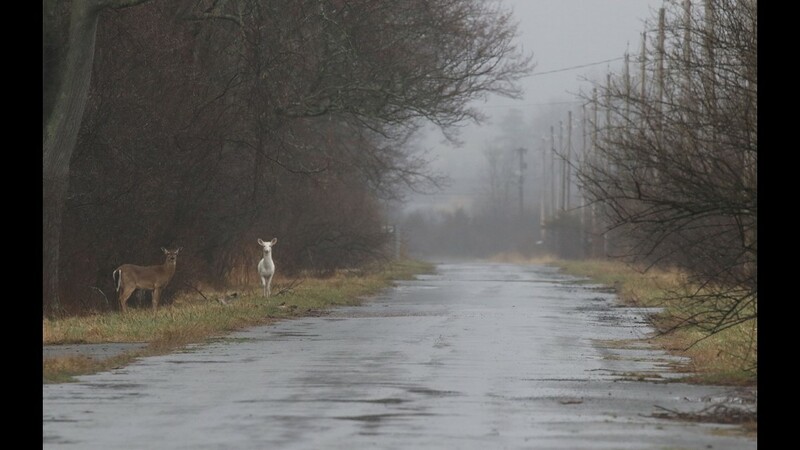 A couple deer, white and brown, cross the road. 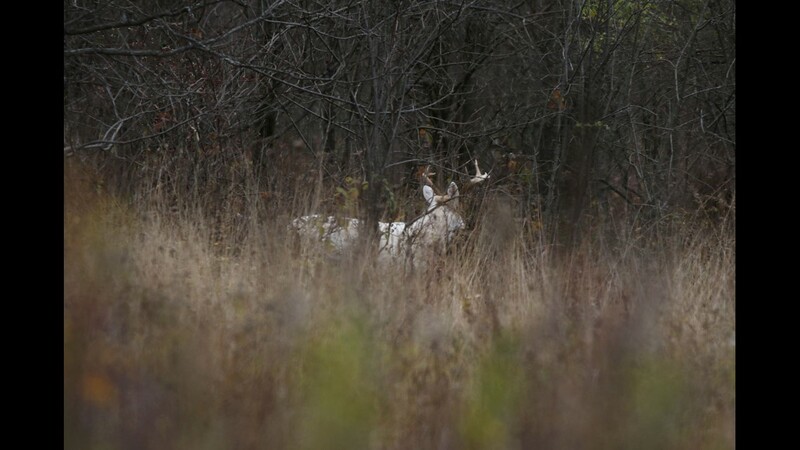 Seneca white deer don't blend into the woods like the brown ones in the woods. A display of antlers and a deer are also available for viewing. 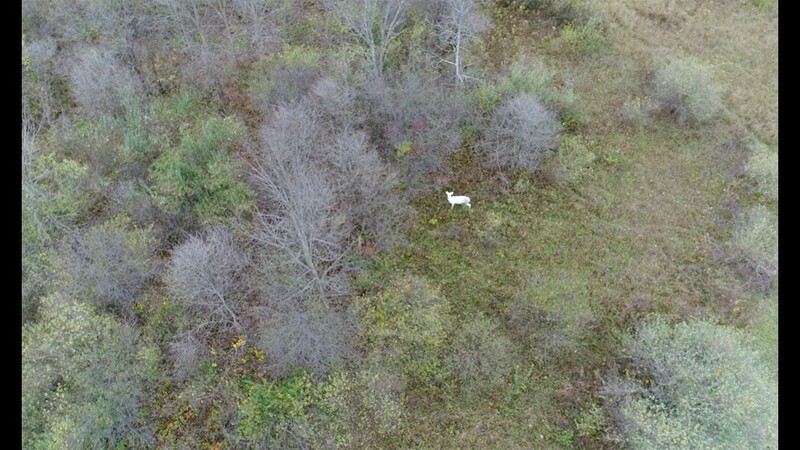 Fall and early spring Seneca white deer can be seen more easily due to leafless trees. 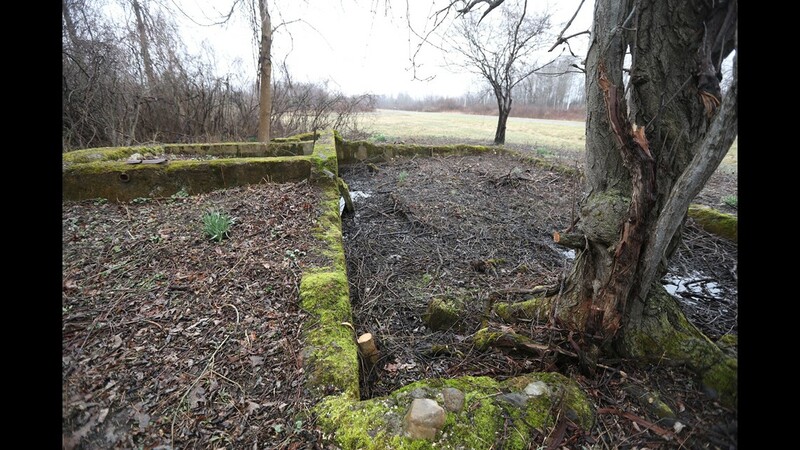 A foundation of a former farm or radar station at the Seneca Army Depot was uncovered. 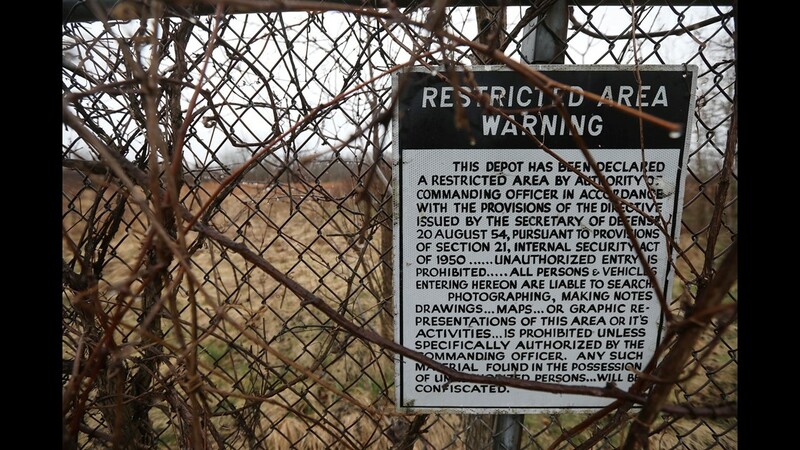 A restricted area warning sign is found along the edge of the Seneca Army Depot property. The sign states making any likeness of the depot is prohibited. A small herd of deer pause in their grazing in front of one of the former WWII bunker. A small bunker was recently uncovered for tourists to view. The park was created to preserve the Seneca white deer. 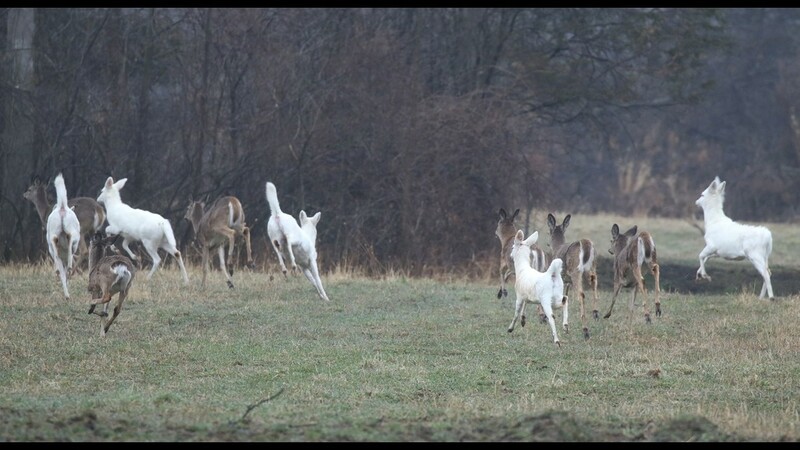 Seneca white deer and other deer run after being startled. Deer run after getting startled while grazing in a field. Various herds both large and small were seen throughout Deer Haven Park. 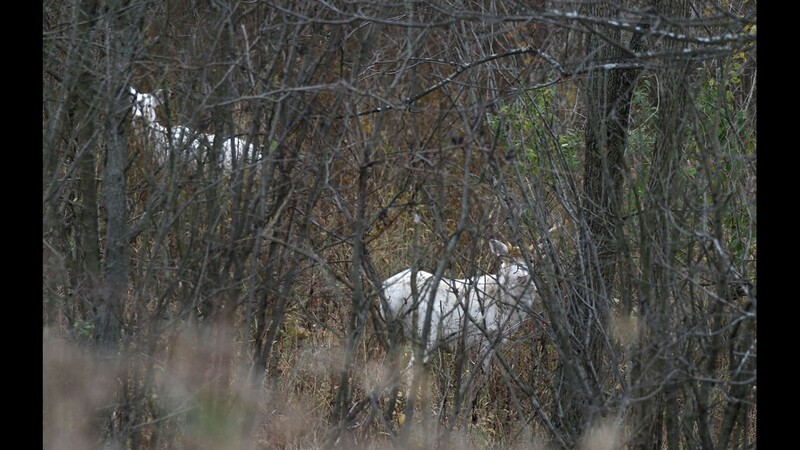 The Seneca white deer can be seen from a far due to the brightness of their coat. 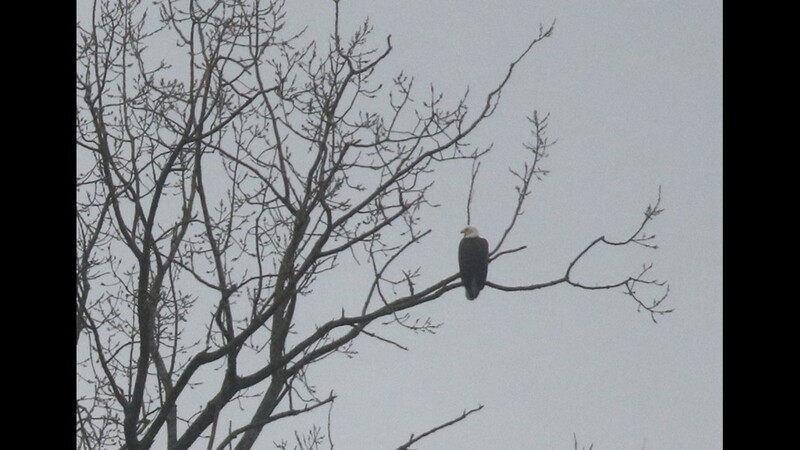 An eagle sits in a tree looking over the area. 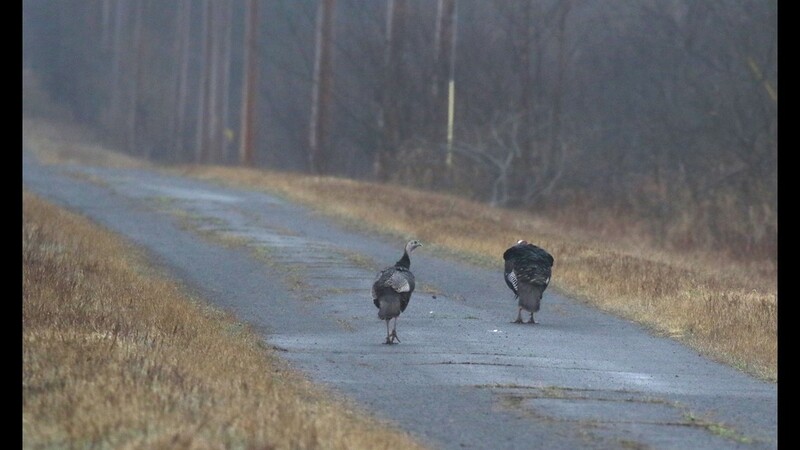 Turkeys can also be seen wandering through the Seneca Army Depot. 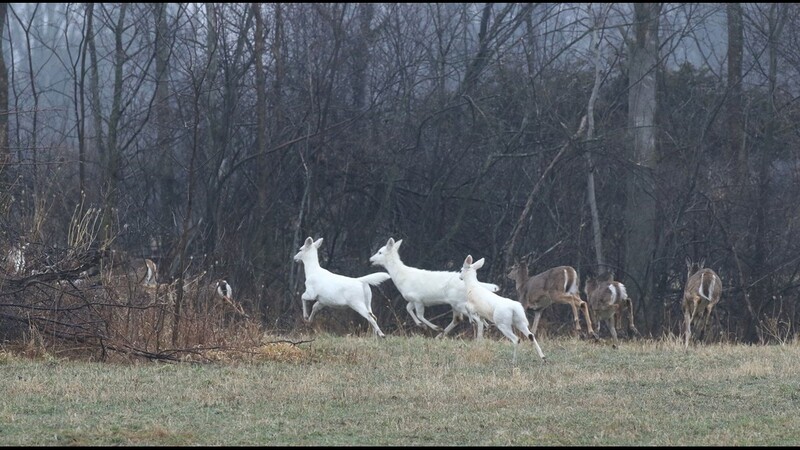 Seneca white deer are one of the main attractions visitors may see during the Seneca White Deer tours. Seneca Army Depot Airfield has lights poking through the field of weeds. 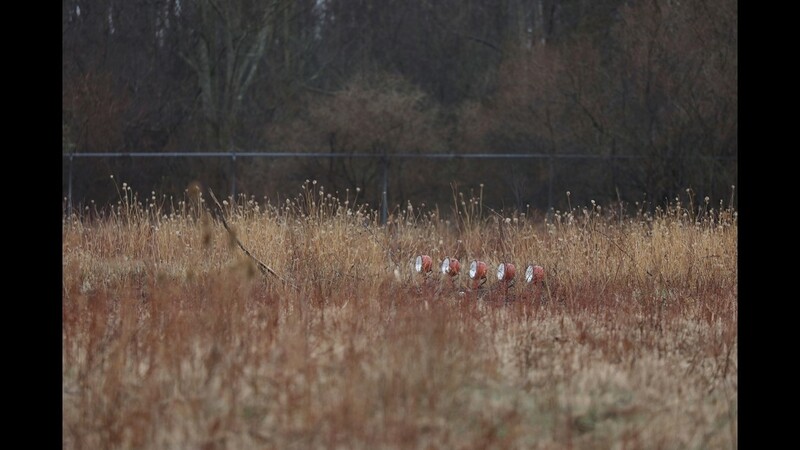 The field is located outside Deer Haven Park on the outer edges of the depot. 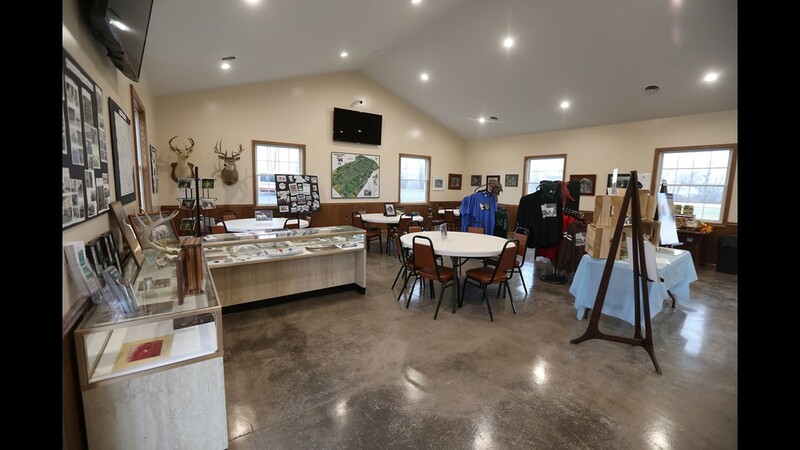 Seneca White Deer has historical information about the Seneca Army Depot inside their welcome center, John and Josephine Ingle Welcome Center. The center is located in Deer Haven Park which is a fenced off area inside the depot. 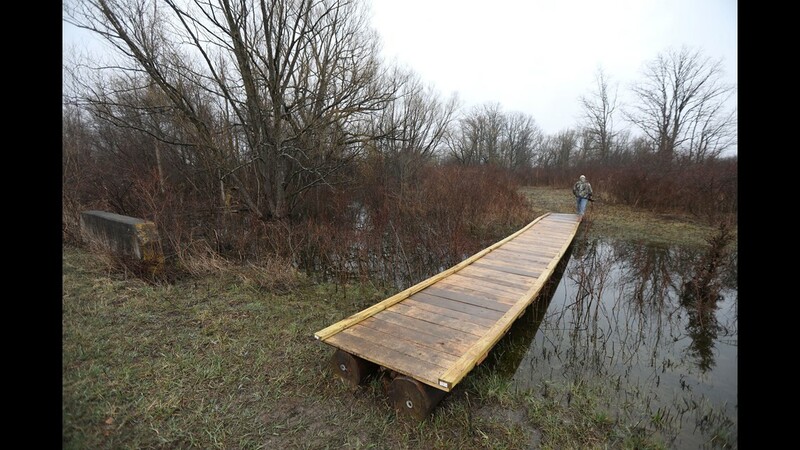 Dennis Money crosses a small bridge used to access the beaver dam. 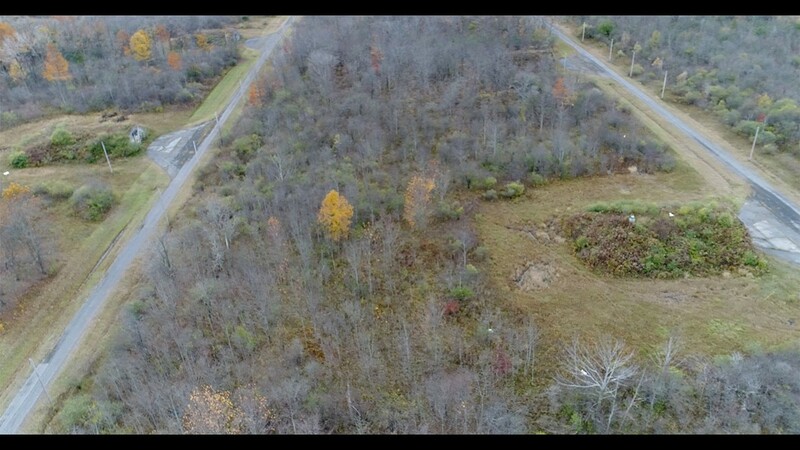 Roads in one area of the Seneca Army Depot have earth covered bunkers on both sides. Every so often a personal bunker, where a few people can take sudden shelter, can be seen. 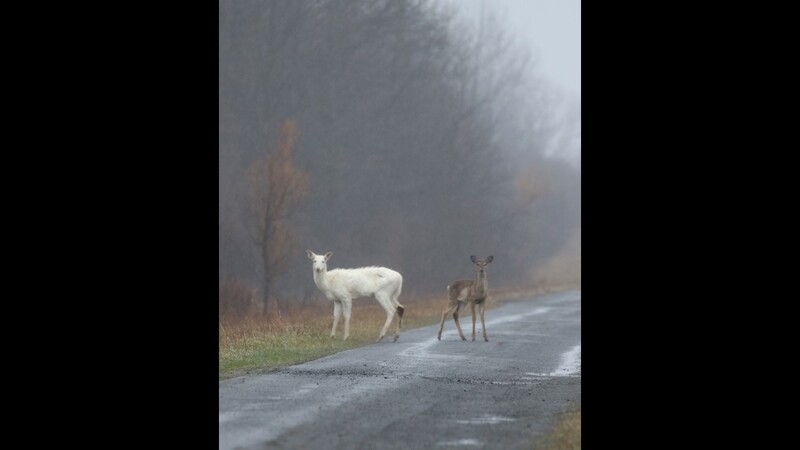 Seneca white deer and other wildlife can be seen on the roads. Seneca white deer pause before going further into the woods. Some of the deer aren’t pure white. 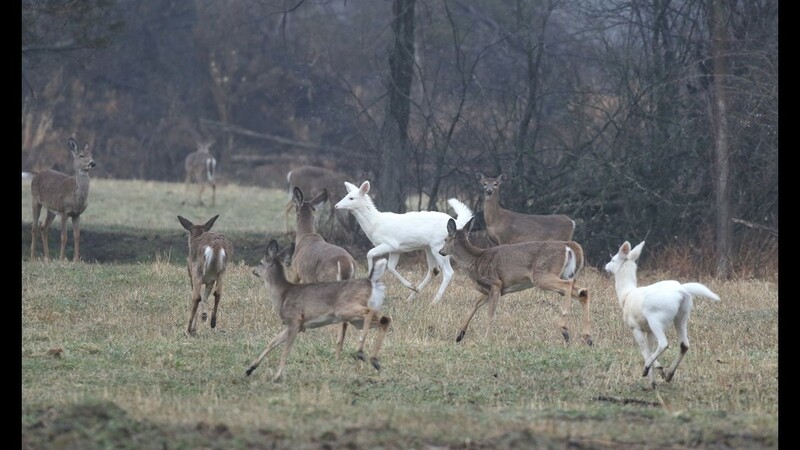 A herd of deer including Seneca white deer take off after grazing in a field. Visitors can also see other types of wildlife and learn the history of the depot. Stops also include the chance to explore some of the WWII bunkers. 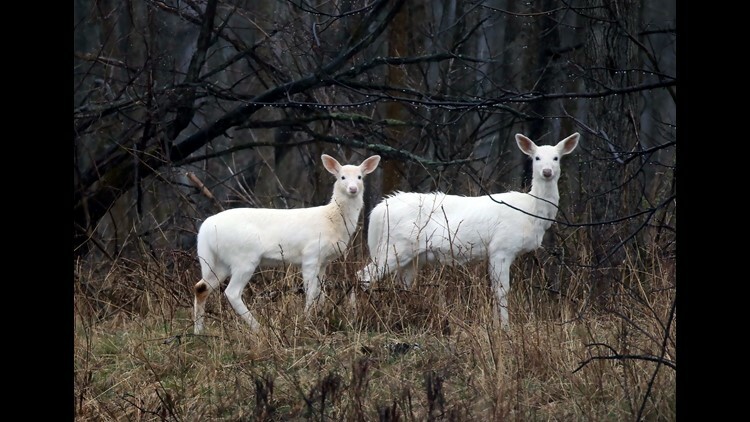 The Seneca white deer have been around for many decades. A Seneca white deer leaps up and over a ditch. 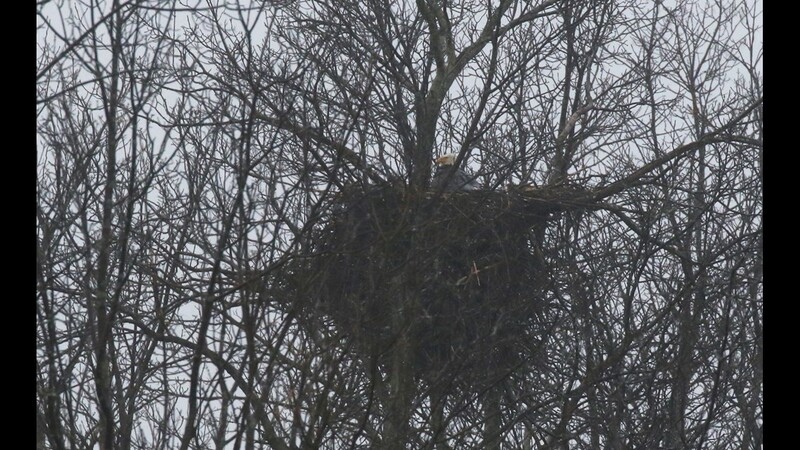 A mother Bald Eagle sits on her eggs. Some of the WWII munitions bunkers are more overgrown than others. 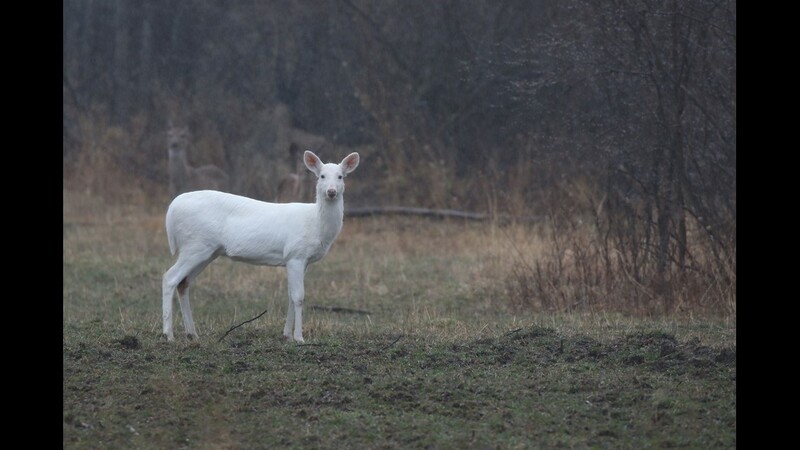 There is no guarantee that people will see the white deer but chances are good. Deer graze along the side of the roads. 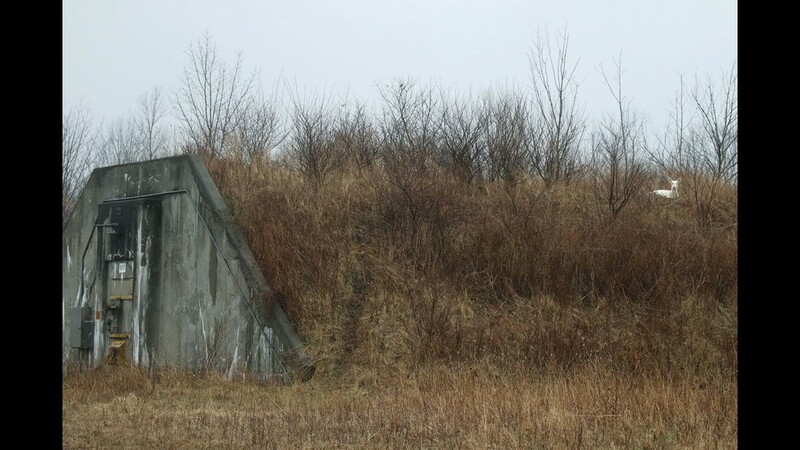 Just the flash of the deer tails are visible as the deer run up and over a munitions bunker. 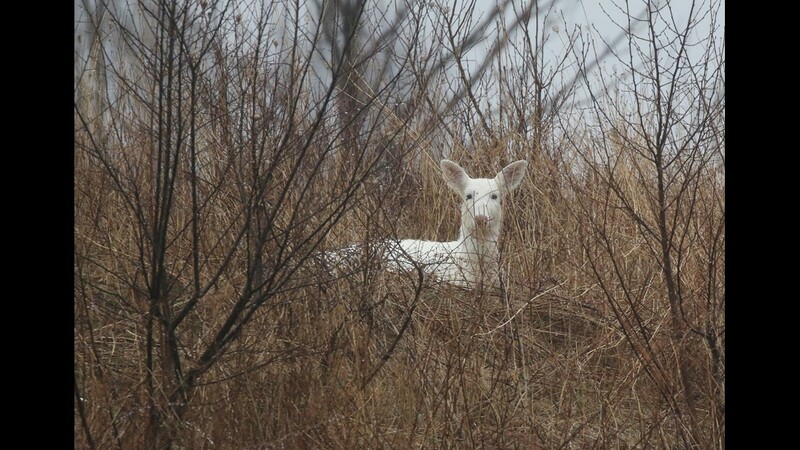 A Seneca white deer rests in an overgrown grassy area. 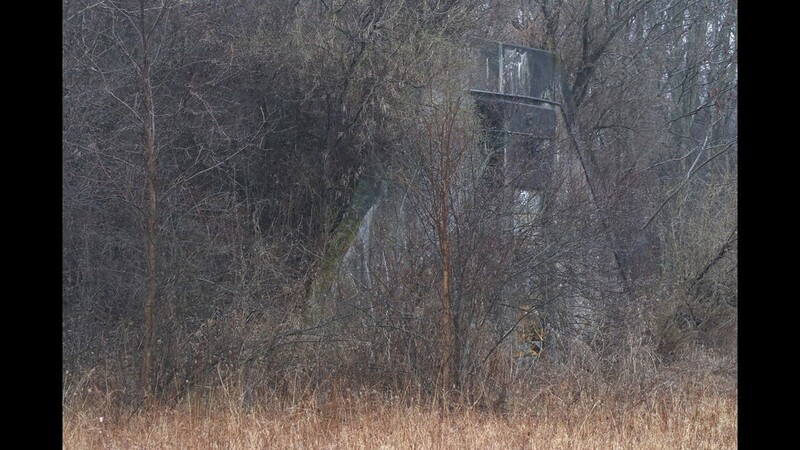 A Seneca white deer makes a bed on top of a munitions bunker. Dennis Money, President of Seneca White Deer, takes video of a Seneca white deer lying on top of a bunker. 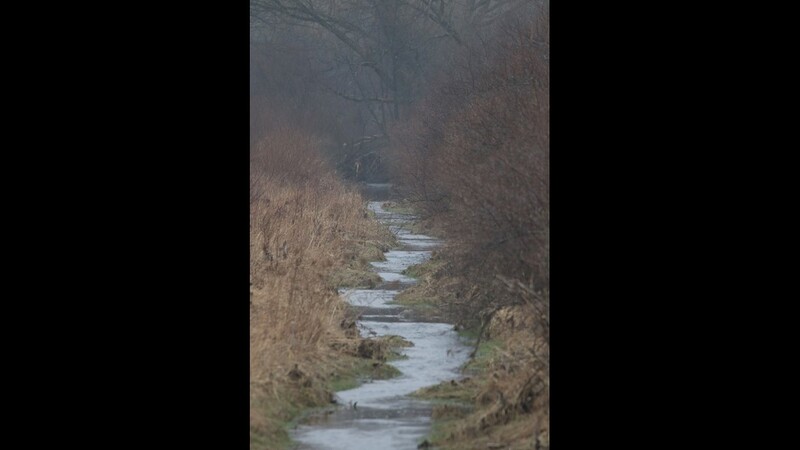 Water flows slowly through this creek area due to a beaver’s dam on the other end. 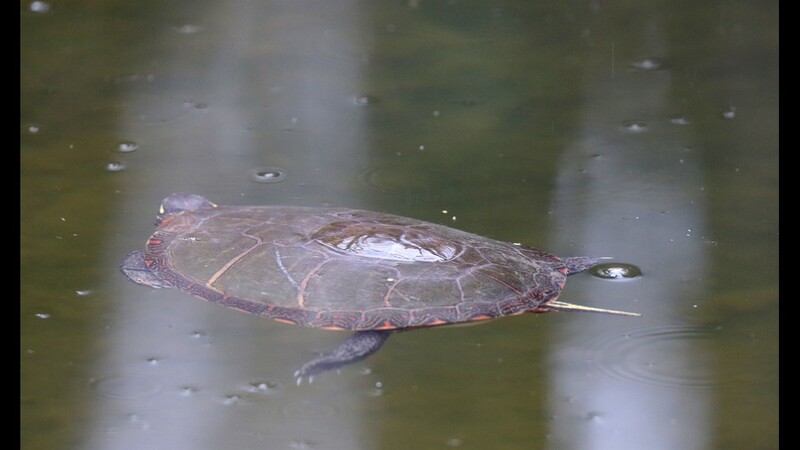 A turtle swims in a pond created by a beaver's dam. 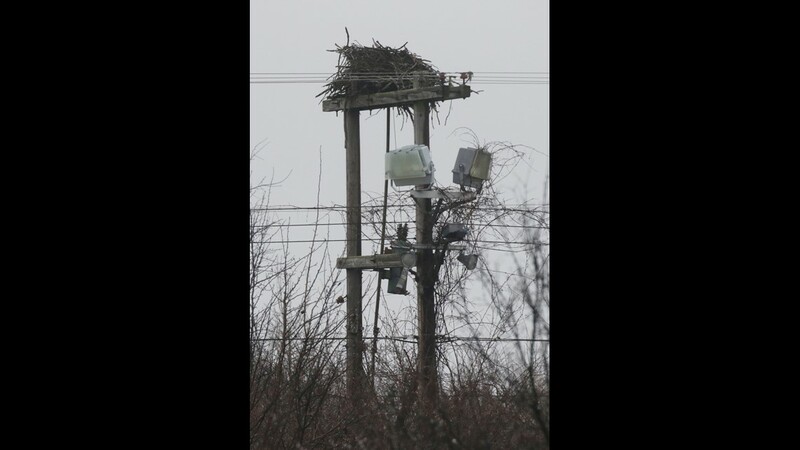 An empty osprey nest sits on top of an electric pole. 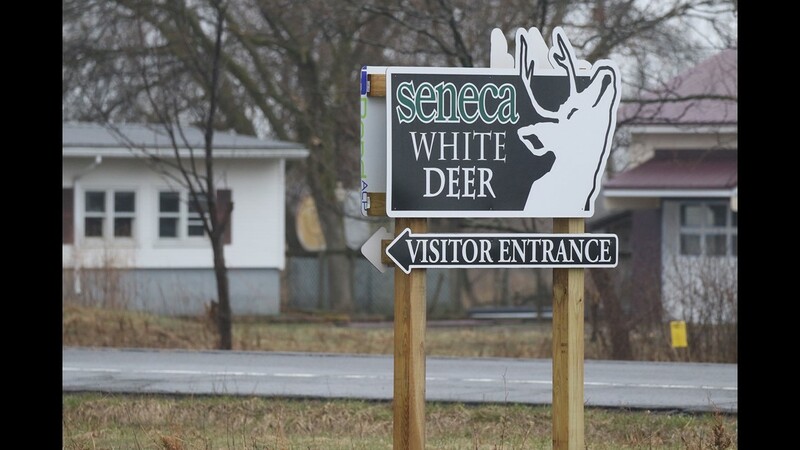 Seneca White Deer tour sign is located on Rt. 96A in Romulus. 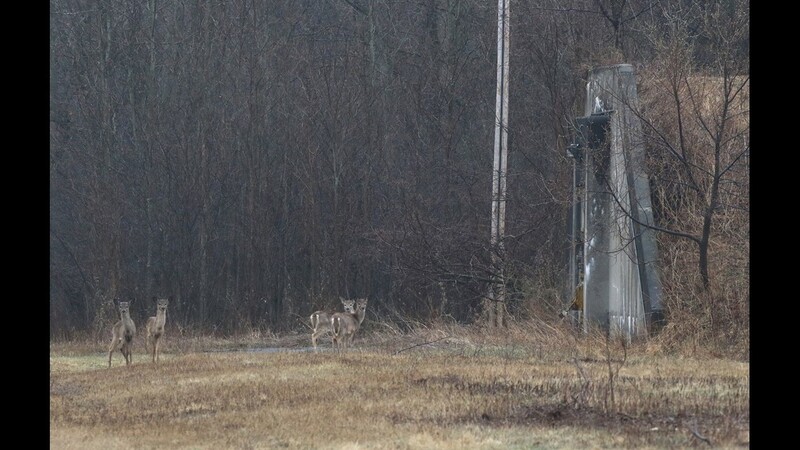 A piebald doe, a white deer with brown spots, and other wildlife at the former Seneca Depot that includes some of the 519 munitions igloos. A white deer hiding among the trees. 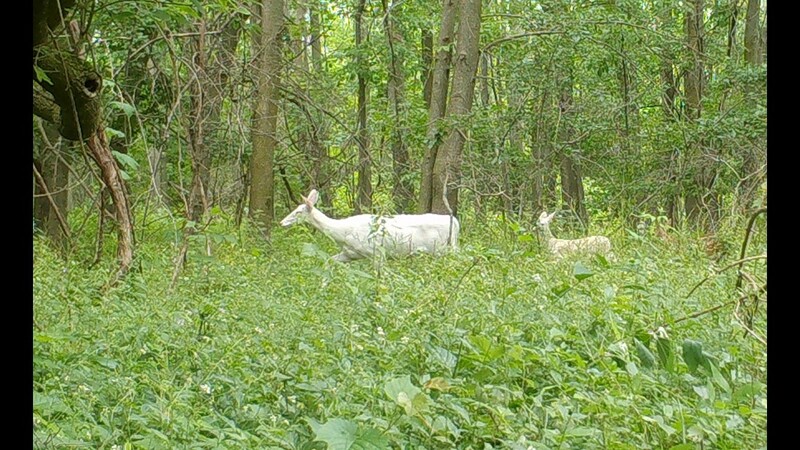 White deer and fawn captured on a trail camera in the former Seneca Army Depot. 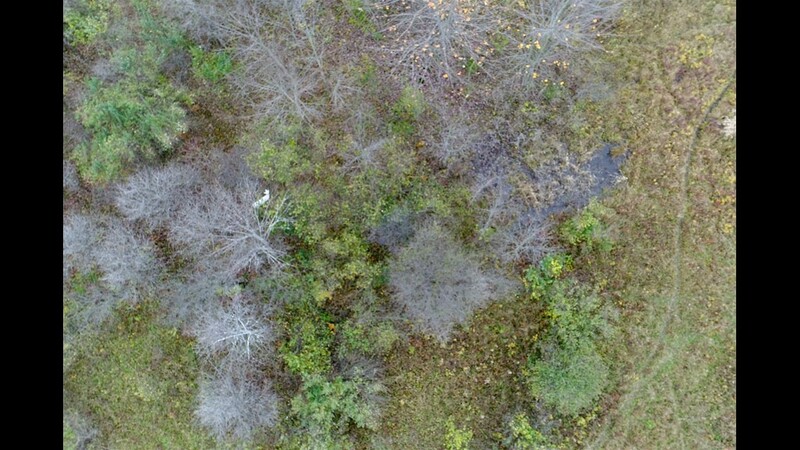 Habitat improvement work over the past year by new depot land owner Earl Martin has had noticeable effect on white deer survival. 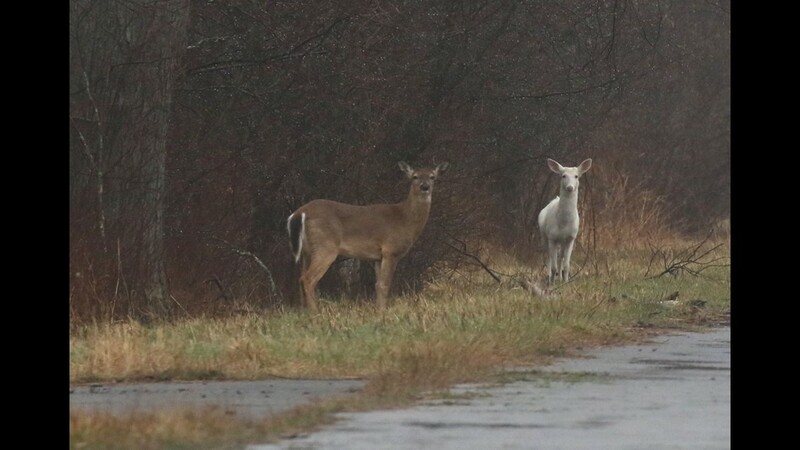 A piebald buck, a white deer with brown spots, walks through the woods towards a doe. 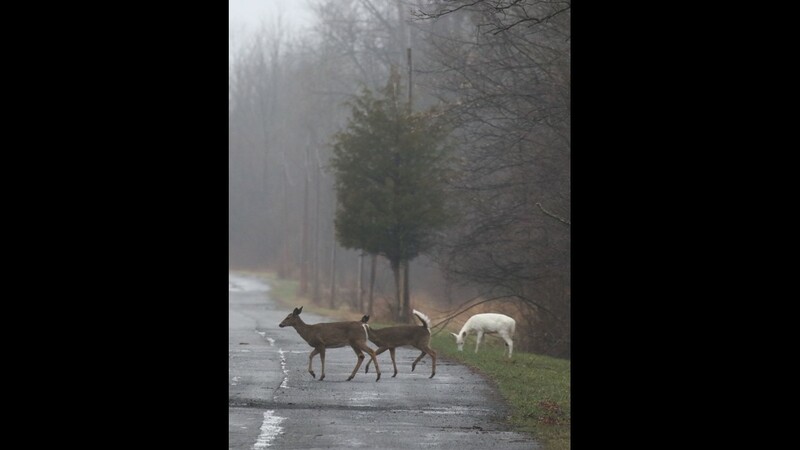 Former Seneca Army Depot is home to herd of rare white deer. Their fate was in peril until businessman Earl Martin purchased remaining 7,000 acres and entered partnership with nonprofit Seneca White Deer, Inc. Eco-tourism plans are now in full swing. Piebald doe, a white deer with brown spots, forages in an open area. A white deer and piebald buck among the trees not far from an igloo. 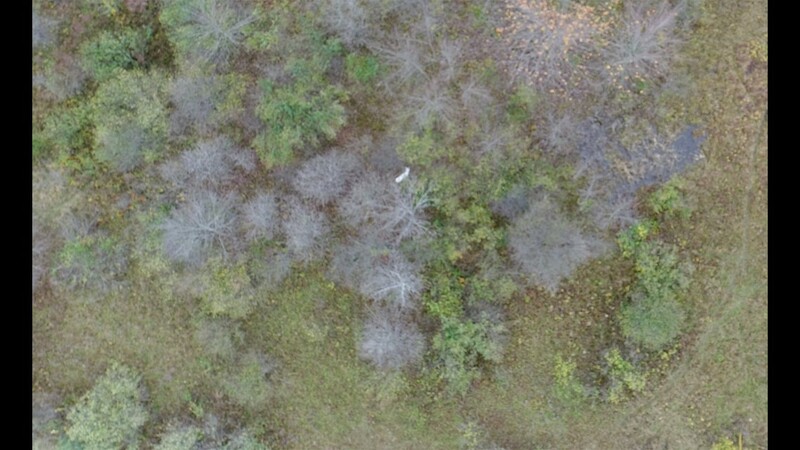 A white deer stands out against the barren trees. 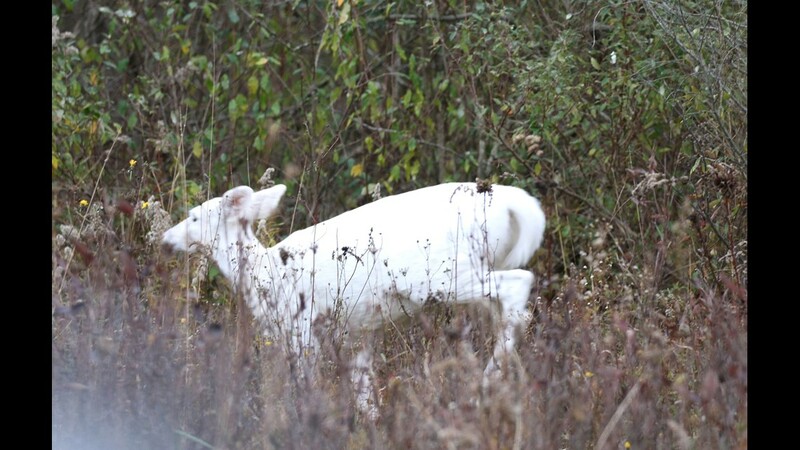 A white deer at the former Seneca Depot. White dots around the igloos on the right and one on the left are white deer foraging or hunkering down. 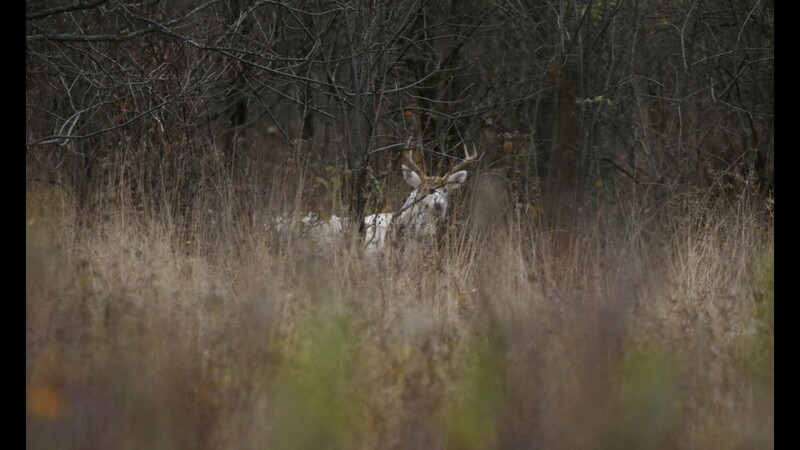 A piebald buck, a white deer with brown spots, moves long the tree line. A white deer takes shelter among trees. A white deer off flashing its white tail as it runs inside the Seneca Depot. • What: Guided wildlife and military history bus tours at the former Seneca Army Depot near Romulus, N.Y. 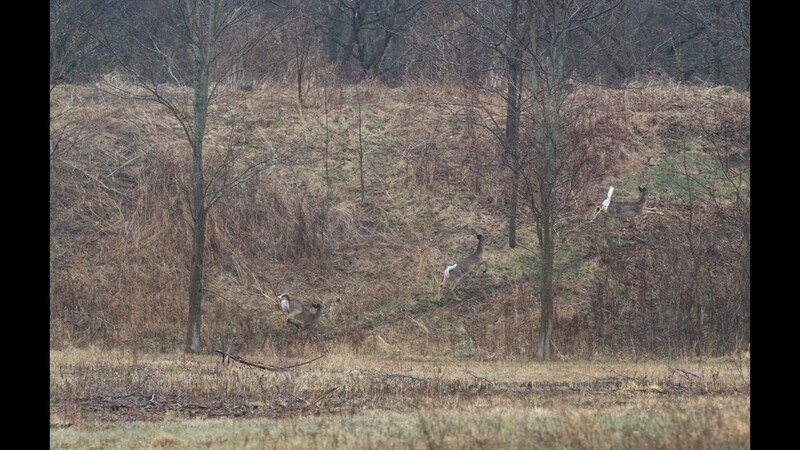 Deer Haven Park is home to world's largest herd of white white-tailed deer. • Where: Welcome Center is at 5537 Route 96A, about 10 miles south of Geneva and 3 miles west of Romulus. • Cost: $30 adults, $27 seniors 65 and older, $15 children 5 to 17, free for children younger than 5. Tours last about 90 minutes. 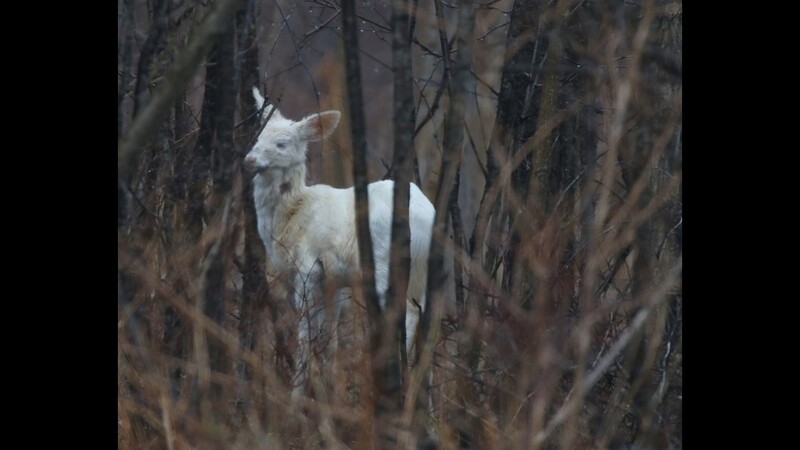 Seneca white deer, which are not albinos, have been around for decades and allowed to thrive behind the fencing of what was the Seneca Army Depot near Romulus, N.Y.